This Domin model is built with a stonewashed blade and a blue G-10 handle. Out of the box the action was so smooth and required no break in at all. However, after a few days the action softened up even more and made the knife even more enjoyable to open up. The stonewashed finish is unique and subtle. Looks really classy. Handle has plenty of room for all your fingers and has no ergonomic grooves to force your hand in any certain position. This could be seen as both a positive and negative but in my case I like to room and freedom to make my own grip. Carries light and slim in the pocket. I'm going start by echoing Matt's review. I bought this knife excited for a bearing pivot and it definitely DOES NOT have that. So it took some breaking in but it can flick decent but nowhere near what I would have expected with a bearing pivot. So that was a bummer. Beyond that though, the knife is awesome. 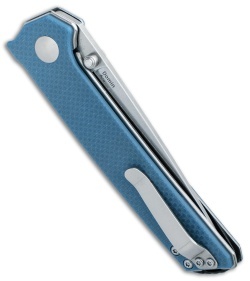 Design is great and it is a very attractive knife. VG-10 steel, color G-10, nice blade shape, all for $52. You can't beat that. First off, there's a lot of conflicting information about this knife floating around the 'net (including on this very site). 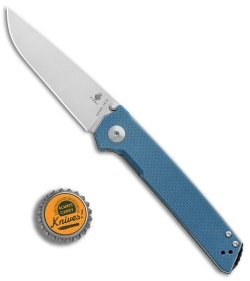 Let me state for the record that this knife does NOT have a bearing pivot as advertised here and elsewhere. It runs on three stacked washers on each side of the blade: a phosphor bronze/teflon/phosphor bronze sandwich on each side, if you will. Now, there's nothing inherently wrong with that, if that's what you know you're getting when you order. 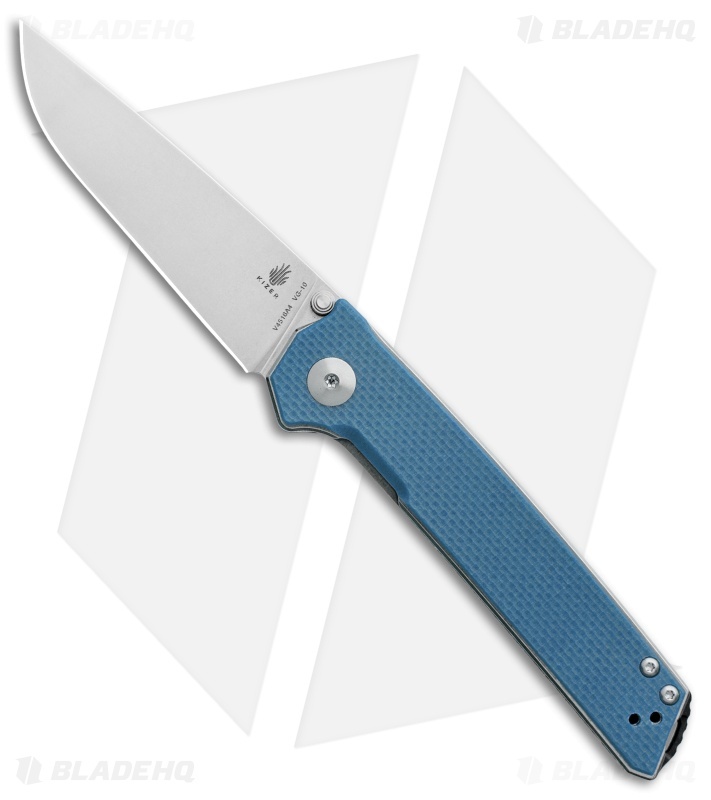 Pivot type is a very definite selling point on a knife, and preferences are strong for many reasons. 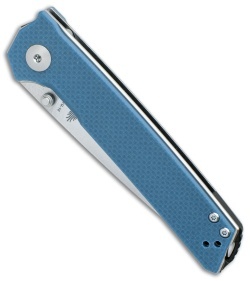 So what we end up with here is basically a modified Begleiter, which was also a very good knife. Without the advertised pivot, this knife has one real, quantifiable improvement over the Begleiter; namely, the Domin lacks the coated/painted blade, which to many, caused the earlier model to be less than ideal. It's a definite improvement in that regard. Final verdict is that if what you're looking for is a modified Begleiter without a coated blade, then you'll be happy with the Domin. If, however, you're excited by the product description here and elsewhere, temper that excitement, because you're not getting a knife with a bearing pivot. Good value, nice fit/finish. Action is pretty good, especially after disassembly/cleaning/lubricating. Given that Kizer's official site doesn't even show the Domin as an available model, it's impossible to confirm whether or not Kizer is responsible for the misinformation, so caveat emptor. Good knife, but could've been so much more...and I expected so much more from the widely-available stats. For a knife that costs 52 dollars this is damn near perfect. I also own the Kizer Begleiter which was also top-notch in every way and was the motivating factor to pick up the Domin. Fit and finish are near flawless, buttery smooth action, perfect size and weight, excellent blade shape that’s actually useful, left-hand friendly reversible pocket clip.... I could go on and on. Just do yourself a favor and pick one up.